The COMPACT-SERVO 18-80mm T4.4 EF-mount lens combines the benefits of compact size and light weight (only 2.65 lbs.) for outstanding mobility. 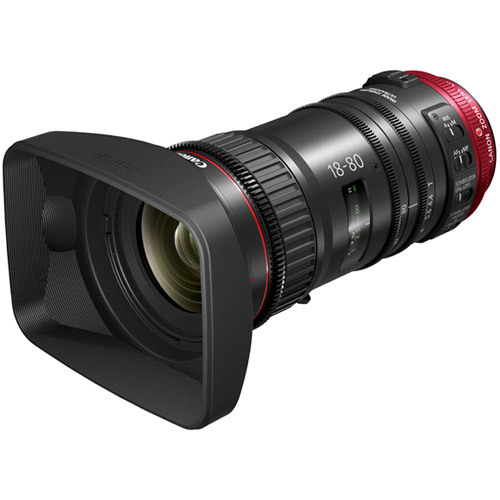 Designed to shoot video, this lens can be ideal for the cinematographer moving up from EF lenses, combining the functionality of Canon's EF lenses with the video shooting features of their Cinema lenses. Different aspects of lens performance are emphasized when shooting video as opposed to still images. 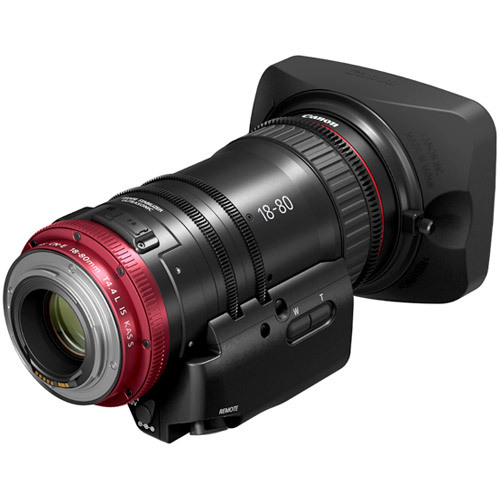 A zoom range through commonly used focal lengths, high level 4K optical performance and a smooth aperture iris designed for motion picture capture all demonstrate the COMPACT-SERVO 18-80mm T4.4 EF lens’s optimization for video. A zoom can be useful in narrative or documentary video production for capturing wide to medium fields of view. The 18-80mm T4.4 EF lens is parfocal in both manual and autofocus modes. The lens employs a special compensating lens group that moves to maintain precise focus while a separate lens group performs the zooming action. Maintaining focus while changing focal length allows the lens to be used in video production where zooming while recording is required. The 18-80mm T4.4 EF lens maintains a wide aperture of T4.4 (F4.0) throughout their zoom range. This allows zooming while at maximum aperture without any dimming of the image. The 4K optical performance of the 18-80mm T4.4 EF lens produces a significantly sharper image than 2K/HD. The various advanced design strategies used help to ensure over 4K resolution at picture center and a careful control of falloff of image sharpness at picture extremities. The excellent contrast range associated with High Dynamic Range (HDR) imaging helps ensure both deep black reproduction and the excellent handling of scene specular highlights. HDR image capture significantly enhances both the contrast and the richness of colors in a scene, but it also poses a potential challenge in exacerbating the visibility of any lens chromatic aberrations. The 18-80mm T4.4 EF lens was designed to help minimize such aberrations. Canon’s color science has become highly refined over generations of lens designs, paying the closest attention to a pleasing skin tone reproduction. The 18-80mm T4.4 EF lens can be used interchangeably with other Canon Cinema lenses during the same production since both have the same warm, cine-look color characteristics — making it easier to maintain consistent color when multiple lenses are used. The 18-80mm T4.4 EF lens can smoothly adjust between open and closed for precise exposure control and live in-shot changes. The 9-blade iris creates a rounded aperture so out-of-focus highlights appear circular. An odd number of iris blades also help create a less distracting flare. The iris on the lens can also be completely closed, which is useful when adjusting black balance. The aperture on the 18-80mm T4.4 EF lens can close completely, allowing no light to pass through. This is useful in black balancing a camera. The auto exposure system in the 18-80mm T4.4 EF lens capitalizes on Canon’s Electromagnetic Diaphragm (EMD) technology that has been highly refined over many years in the EF lens series. This technology integrates the lens iris assembly and a miniature stepping motor in a single unit. Electronic pulses from the camera controls the motor to map numerous steps across the full range of the iris mechanism. This AE control loop is fast and silent. An AE Shift mode allows a small manual override for fine adjustments to exposure. The COMPACT-SERVO 18-80mm T4.4 EF lens includes the functionality of professional broadcast and cinema lenses along with compatibility with professional lens accessories. It fits these features in Canon’s unique design that allows it to remain compact and lightweight. This best-of-both-worlds approach allows the versatility to shoot with the lens in a wide range of productions. The 18-80mm T4.4 EF lens incorporates a servo drive unit directly in the body of the lens. The servo drive unit allows electronic control over zoom, and provides an option to be disengaged for direct manual control. The integrated design can power the servo drive through the lens mount on appropriate cameras, or power can be input through a separate port as in traditional lens servo systems. 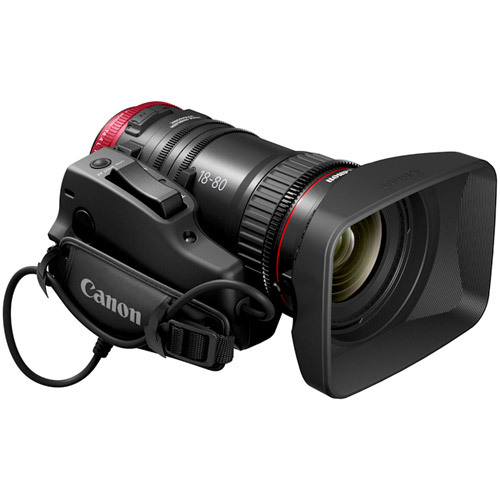 The servo control is compatible with Canon’s ZSG-C10 Zoom Servo Grip which can be mounted directly onto the 18-80mmT4.4 EF lens, as well as standard broadcast style controllers (including Canon’s FPD-400D and ZSD-300D) for remote operation. On select Cinema EOS cameras, the EF lens mounts electrical contacts provide the necessary power to operate the servos on the 18-80mmT4.4 EF lens. This helps eliminates cabling and possible mounting issues. The lens can also be powered remotely through an accessory power port. The 18-80mm T4.4 EF lens’s Servo Control can be operated remotely for tripod or other non-handheld use. Canon’s FPD-400D Digital Focus Servo Demand for Canon Lens Control Kits can be used for remote focus control and the ZSD-300D Digital Zoom Servo Demand for digital ENG/EFP lenses used for remote zoom control. For use in studio configurations, an optional Zacuto® Z-CNYC Y-cable can be used to connect zoom and focus controllers to each lens. This configuration allows for simultaneous zoom and focus operation with Compact-Servo lenses. For handheld operation, the 18-80mm T4.4 EF lens incorporates a rosette mounting point for the optional ZSG-C10 Zoom Servo Grip. This handgrip features a rocker control for the zoom servo, a button to engage One-Shot Autofocus. It can be rotated on the mounting rosette and adjusted for comfort. Accessory mounting is available for use on camera front rods. The 18-80mm T4.4 EF lens borrows from Canon’s experience in EF lenses to make a compact and lightweight design while retaining performance and functionality. This allows the lens to be used handheld and in various conditions, providing a high amount of mobility and versatility. The 18-80mm T4.4 EF lens is the same size and nearly the same weight as its sister lens, the COMPACT-SERVO 70-200mm T4.4 EF lens. The 18-80mm T4.4 EF lens is built to be compact and fully compatible with a variety of professional lens accessories. The front diameter is 84mm for mattebox mounting, with a removable sunshade included. The front ring’s inner diameter is threaded for use with 77mm screw-in filters. An integrated support foot can be used to stabilize the lens on standard camera bracketry, and the zoom, focus and iris rings are geared for use with follow focus and other traditional mechanical and electronic controllers. Canon has designed the COMPACT-SERVO 18-80mm T4.4 EF lens specifically to work with compatible Cinema EOS cameras, resulting in a complete kit that adds enhanced functionality. Integrated autofocus, smooth image stabilization, connected control and metadata information as well as lateral chromatic aberration correction are all available when using the lens on compatible Cinema EOS cameras. Canon cameras feature advanced autofocus functions. The 18-80mm T4.4 EF lens is designed to work with select Cinema EOS cameras to offer fast and accurate autofocus control. All autofocus controls can be switched off to allow manual focus. Different Canon cameras offer various types of continuous autofocus functionality. The fast servo response of the 18-80mm T4.4 EF lens allows for continuous smooth autofocus as with select Cinema EOS cameras. All electrical control of the lens is done directly through the EF-mount. Select Cinema EOS cameras can use autofocus technology even with the servo control on the 18-80mm T4.4 EF lens disabled. Even with the lens in manual mode, the camera will detect its focus setting and can indicate suggestions in the viewfinder on adjustments for focus in the image. The 18-80mm T4.4 EF lens is a medium to telephoto zoom. The longer the focal length the more sensitive it is to any shake in the movement. The lens offers three levels of Image Stabilization, including the standard mode for handheld operation, a maximum mode for high-frequency movement and a smooth mode intended for tripod-based operating. The IS function can also be switched off entirely. There are a host of functions designed to help maximize the integration of the 18-80mm T4.4 EF lens with select Cinema EOS cameras. Integrated autofocus, smooth image stabilization, connected control and metadata information, and lateral chromatic aberration correction are all included when using the lens on compatible Canon Cinema cameras. 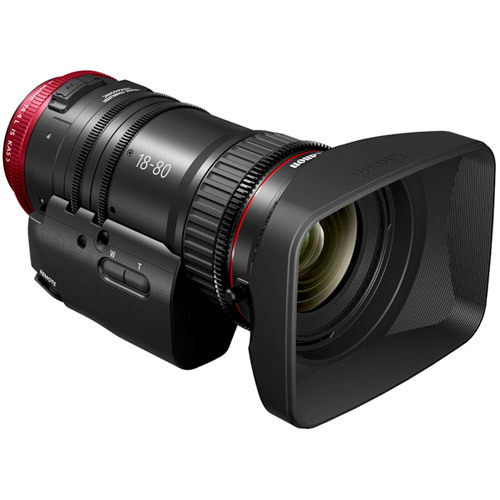 Select Cinema EOS cameras can power and control the servo drive of the 18-80mm T4.4 EF lens by electrical connection through the EF-mount. A zoom control on the camera body can alter focal length, the autofocus modes of the camera can directly engage the lens focus servo, and the auto exposure camera functions can operate the lens iris to adjust light transmission. Integrating these controls allows easier single-person camera operation, and the 18-80mm T4.4 EF lens can be switched into a partial or fully manual mode if desired. Through the EF-mount, the ZSG-C10 Zoom Servo Grip that mounts to the 18-80mm T4.4 EF lens can control record triggering on select Cinema EOS cameras. The optional handgrip also features a zoom servo rocker control and an autofocus engage button. Select Cinema EOS cameras can communicate with the 18-80mm T4.4 EF lens to profile its illumination characteristics, and electronically compensate for image brightness dimming in the edges of the frame. The 18-80mm T4.4 EF lens was designed to help minimize lateral chromatic aberration for Super 35mm sensors. Any remaining minimal lateral chromatic aberration is mathematically mapped so that the lens can communicate with select Cinema EOS cameras, which then in turn electronically correct for the artifact. The 18-80mm T4.4 EF lens sends reference information constantly to the camera, noting precise settings for focus, iris and zoom. Data is also transmitted about the lens model itself, and on select Cinema EOS cameras. 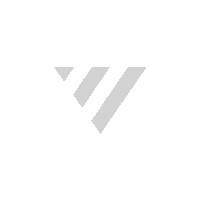 This information can be recorded for use in post processing. This is useful when matching cameras as well as in VFX work. Some of this data can also be displayed in the camera viewfinder. The 18-80mm T4.4 EF lens sends metadata information of the iris position through the EF-mount to the camera. On select Cinema EOS cameras, this information can be displayed as a T-stop, which indicates the amount of transmitted light through the aperture. It can also be displayed as an F-stop.